Welcome to my Zen bathroom. A few years ago, George and I went to Belhurst Castle in Geneva, NY for a long weekend/off-season getaway. The Castle and the grounds were beautiful, but they were only one place, and on night number 2 we wanted to get out, go somewhere local, and just relax. The bartender at the Castle suggested Vonnie’s Boat House, which was just a short ride down the road and bonus! They had trivia that night. I like a bar when it gets a little divey, a little road-housey, so I was sold immediately. We walked in, we grabbed a table. The trivia master asked us if we were playing, we said yes. A minute later, one of the other trivia contestants waved me to her table. Me? Really? I thought maybe I had toilet paper on my shoe or something and she wanted to tell me about, but no. Instead, she handed me a shell. At the end of that night’s trivia session–wherein we got our asses kicked in the game, but had a great time with the other players–I went to hand the shell back to my mysterious shell benefactress. It’s in my bathroom now, right next to my Peace rock. So thank you, sea nymph shell lady. Your crazy scheme of unrepentant welcome to a couple of strangers worked. 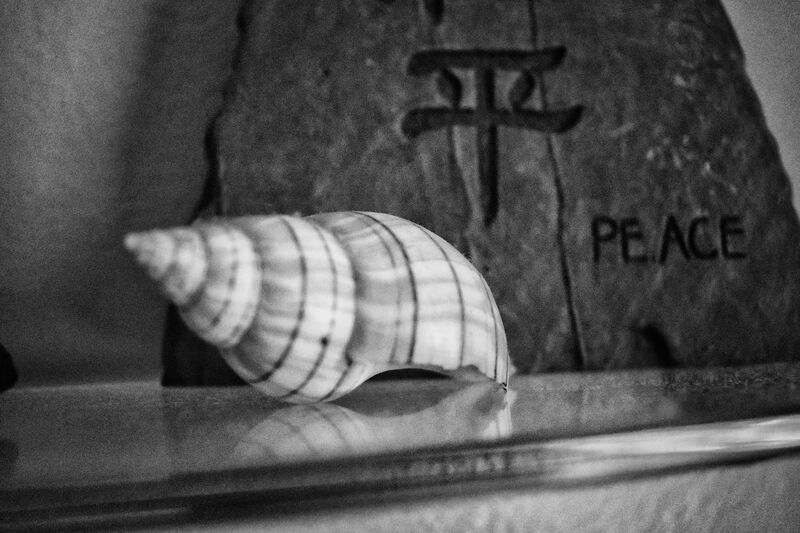 I see the shell every day, and think of that strange and lovely encounter often. It’s a great, practical reminder that we CAN be kind to someone we don’t know, for no other reason than the benefit of kindness.